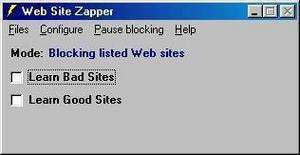 Web Site Zapper closes Web browsers that are displaying undesirable Web sites. It can be used either for popup control, or to control Internet access. It can also control WHEN people can access the Internet. Create lists of good and bad Web sites, either manually or by having Web Site Zapper build lists automatically. Web Site Zapper 9.2.0 is a shareware program and can be used as a demo to try the software until the free trial period has ended. A full version of the program is available after the trial period ends. For security reasons, you should also check out the Web Site Zapper download at LO4D.com which includes virus and malware tests. Additional screenshots of this application download may be available, too. Mainly outdated and archiveware programs offers the ability to block popups from within popular browsers like Internet Explorer, Firefox and Google Chrome. Check out some of the freeware downloads available in the ad blocker category. They contain no strings and are available at zero cost.